Eye On Sports Media: Tiger and Jon Gosselin to Have Reality Show Together? Tiger and Jon Gosselin to Have Reality Show Together? TLC has been milking the Gosselin family for ratings for a while now, and upped the ante when their marriage hit the skids. 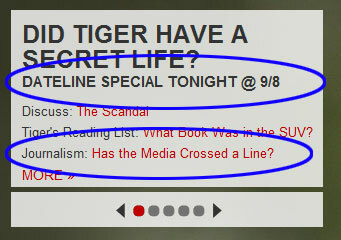 Well that is old news that is not as hot as Tiger Woods, and TLC is not letting the opportunity pass them by. Here is the front page splash for their web site today, followed by a shot of a hypocritical question on the part of this Discovery Channel owned network. If TLC (and NBC "News") hasn't crossed a line with this sensationalization, then maybe all that is left will be a reality show featuring Woods and Jon Gosselin? 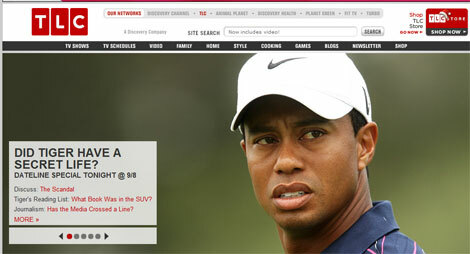 Woods might need the money to pay the huge alimony bill if his game goes south.